A mumps outbreak that started in Whistler has hit the University of British Columbia. There have been seven cases on campus this year, including three at the Sauder School of Business, according to Vancouver Coastal Health. Local health authorities are warning students in particular to ensure they have two doses of the measles-mumps-rubella vaccine. Those born between 1970 and 1994 may not have received a second dose and could be more vulnerable to infection. A health advisory on the university’s health service page warns students of an outbreak in Metro Vancouver and includes the option to book an appointment for a free vaccine. Dr. Nelson said mumps is an airborne virus and communal housing and classrooms in a university setting can breed the illness. 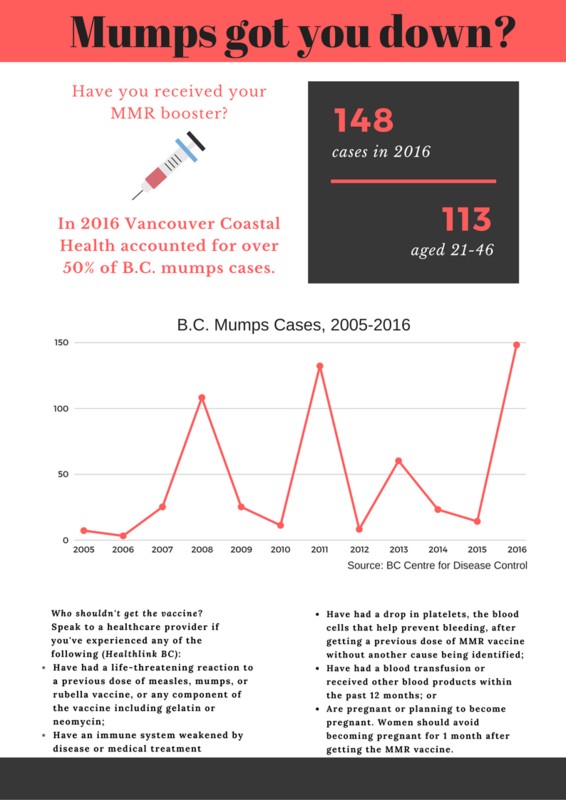 This year the number of mumps cases in the Vancouver Coastal Health region, which includes Vancouver, Richmond and the North Coast, has already hit 91 compared to 86 last year. The province as a whole saw a significant decrease in mumps after the introduction of a second vaccine in 1996. The down trend lasted until 2008, when periodic outbreaks once again began to surface. During a large 2011 outbreak in Vancouver, UBC also warned students to get vaccinated. Last year’s outbreak was deemed the worst this decade, with 148 confirmed cases in B.C. It was linked to an unnamed sporting event in the Lower Mainland and spread in Whistler. The BCCDC reports it likely stemmed from an out-of-province visitor. Mumps is a viral infection that starts as a cold-like illness and then turns into swelling of the salivary glands under the ears or jaw, to create the “chipmunk” effect. A person can be infectious for several days before the swelling begins and up to five days after. It tends to peak in late winter and spring, but can be contracted throughout the year. At its worst, mumps can cause testicular swelling, mastitis, meningitis and deafness but most cases are fairly mild. Although most Canadians were vaccinated as children, in the mid–1990s public health officials found people still contracted mumps in adulthood, which is why they introduced the booster. Those born before 1970 are considered to be immune if they had the disease, and it is believed a person can only contract mumps once. The U.S. Centers for Disease Control and Prevention believe one explanation for the recent outbreaks could be that only two doses of the vaccination – the standard approach for decades– is not enough. In the 2016 outbreak, 35 people who contracted the disease had received only the first dose of the MMR vaccine. Another 25 had received both doses. A second dose is about 88 per cent effective and on the rare chance someone who has received both vaccines gets mumps, it is likely the illness will be less severe. 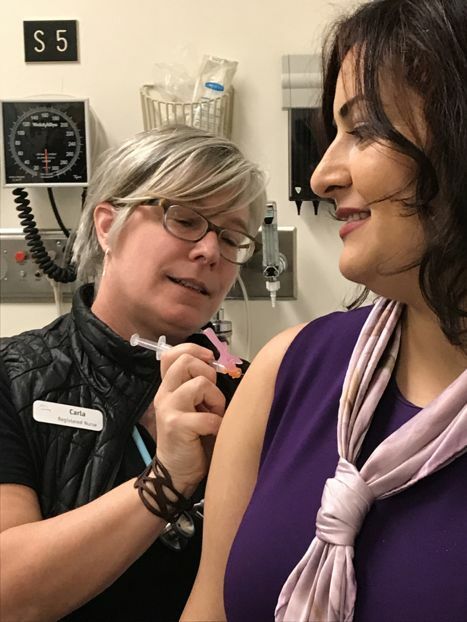 A recent study at The University of Iowa found students who had been given a third dose of the MMR vaccine were less likely to contract mumps than those who had received two doses. The study concluded immunity likely wanes over time, but many feel this is unsubstantiated. The university is now offering students a third dose to help contain a current outbreak, despite the local health department saying there is not enough evidence to show it would benefit those already vaccinated. Meanwhile, at the end of October, the Centers for Disease Control and Prevention voted to recommend a third MMR booster for those most at risk during an outbreak. While UBC is not advising students to get a third dose, they do recommend those who can’t find or access their immunization records to book in for a booster.